I'll admit it, I really didn't want to do another pumpkin review. 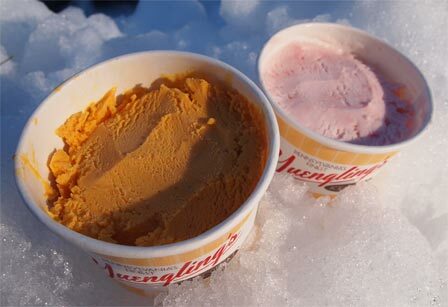 It's fun to do one review of it a year, but it feel's like I've had it a hundred times, and I really didn't want to do it again.... but Yuengling really wanted us to try it, I hate saying no to free ice cream... and I must admit it, I'm glad I agreed. Rather than sending over quarts of their premium Pennsylvania ice cream, they instead sent these fresh little sampler cups instead. Intriguing. Wait, did I mention it's one of those weird days where it's over 50 degrees but there's still snow on the ground. Yeah, we've been outside for two hours and it's time for a snack. I dive in to the pumpkin first expecting not to like it... but I do. 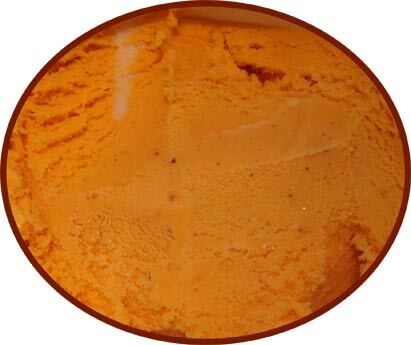 It's got a similar milky ice cream vibe like the Pierre's had but here the spices are more in check and there's also a stronger pumpkin flavor. Nice. Very nice. I quick flip over to the peppermint and wow, I like this one too. Both ice creams have a nice premium texture and I'm digging the flavor profile on this one. It's almost got a bit of that buttermint vibe I found in the Talenti mint gelato. I want to say that there's almost a texture to the flavor, do you know what I mean? Does it remind me of a peppermint puff maybe? Ok, I flip back to the pumpkin because it's really calling my name. The flavor profile is just more my style and it's growing on me with every bite. This one really makes me think of pumpkin bread... and I love pumpkin bread. Ha, there's the cream cheese swirl! I can't say it stands out in this small sampling size, though it could just be contributing to the overall sweetness of the flavor profile. Oh man, it's all gone. Now I waited about an hour before finishing the peppermint and ofcourse I still like it. I love when a flavor tastes like a melted candy cane, I just find it fascinating. Now I know this one is called crunch, but all my candy cane pieces seem to have melted. Sure I could complain, but I really don't care. It works just the way it is. And that's that, don't be afraid to buy either one of these. Well done Yuengling. Nick's Pumpkin Thoughts: I now know what Dubba means when he says the milky ice cream vibe he was getting. It's kinda like a sweet cream flavor with the spices playing more of a supporting role. There's definitely a stong pumpkin flavor that I appreciate. I'm just wanting more of the cream cheese swirl. I feel these sample sizes don't do that swirl the justice it deserves. It's not superly cheesy and reminds me more of icing. While Dubba was comparing this to pumpkin bread, this definitely emulates a pumpkin roll in flavor. All that's missing is some chunks of the cake to make it a perfect replica. Nick's Peppermint Thoughts: While I enjoyed the pumpkin, the peppermint wasn't for me. As Dubba mentioned, it has that buttermint vibe I'm not too fond of. 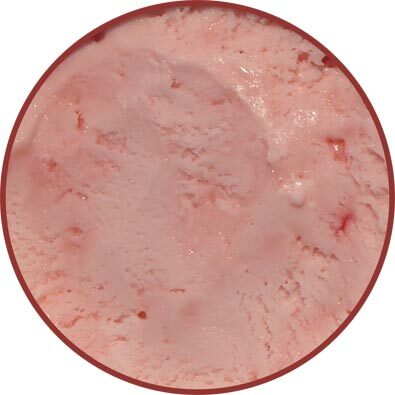 While this isn't "grassy" as I put it in my original Talenti review, it's just too natural for me. I want my mint artifical and nostalgia like! It does have a candy cane vibe to help balance that buttermint factor and the peppermint candy add a nice crunch to make the name hold true. I don't know, this one isn't for me. 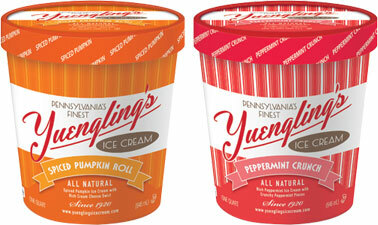 I'd rather just devour a quart of the pumpkin and leave the peppermint to Dubba. The Peppermint Crunch was good, but I didn't notice any crunchy bits in my container.